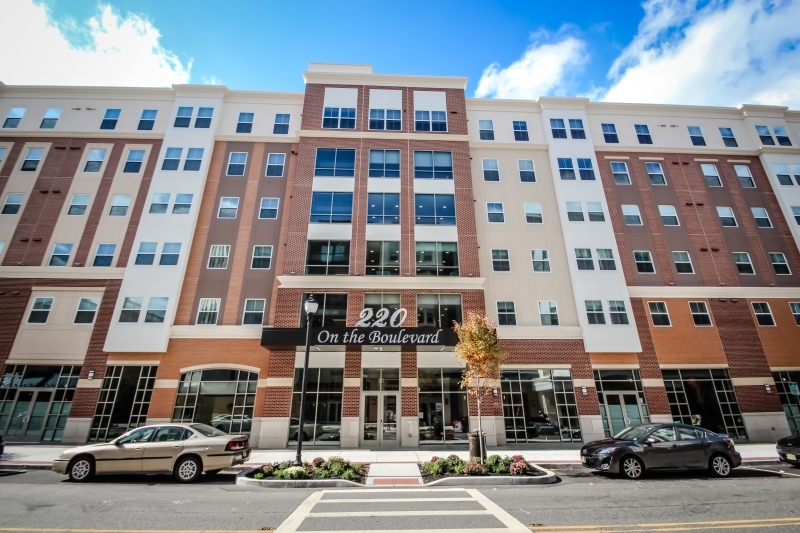 This large-scale student housing project at Rowan University in N.J. relied on StoPanel to meet an aggressive construction schedule. Rowan University in New Jersey needed housing to accommodate its rapidly expanding student body and partnered with the nearby town of Glassboro (just outside Philadelphia) to construct a six-story residential building. The proposed structure, called The Penthouse, was a large L-shaped building with 500,000 square feet of floor space and approximately 200,000 SF of exterior wall. While designed mainly for student housing, there was also mixed-use space on the first floor. The project had to go up swiftly in order to house incoming students that same year, so the construction schedule was exceptionally aggressive. The owner, developer and general contractor, Nexus Properties concluded that the only way they would come close to meeting the desired timeline for completion was by using prefab panels for the walls. Even with that, it was going to be tight. Having worked with Jersey Panel for over 20 years, they enlisted their help. StoPanel was then brought onto the team. The offsite construction plans called for StoPanel Classic, a lightweight prefabricated panel that is both energy efficient and durable, with continuous insulation and the StoGuard air and moisture barrier forming the core of the system. Sto’s versatile choice of finishes would then allow for almost any design aesthetic that was envisioned. The owners were so pleased with the new building, including the quality panels and the waterproofing details, they engaged the same StoPanel Technology team and their affiliate, Jersey Panel Corp. for the next six buildings they constructed. Between 2014 and 2018, seven buildings comprising more than 450,000 square feet and 1,500 wall panels were constructed in three phases. Everyone involved in the process understood that panelization as a construction methodology offered distinct advantages: The buildings could be enclosed before it got cold, and the interior could then be finished. Working on the final six buildings almost simultaneously, they were able to make the panels ahead of time and the installation got faster and easier with each structure. In this case, speed meant cost savings and added value. Sto panels were the right choice for these projects and served the needs of the university and ultimately the city, by creating aesthetically-pleasing buildings with high energy efficiency and superior performance characteristics. The new buildings are a showcase on the campus that Rowan can now use to help attract more students. In this three-part blog series, we are going to explore how the evolution of design and construction processes have dramatically changed in the past decade, especially as they relate to prefabrication and modular construction. We’re not talking about the prefabricated kit homes of the 20th century, but rather offsite construction that accounts for a wide range of projects today, from whole-building modular solutions, to prefabricated walls and mechanical, electrical and plumbing systems that can help contractors accelerate production schedules while employing less labor on site. In today’s labor-constrained construction environment, the prefabrication solution is being increasingly adopted where reduced costs, resource efficiency and meeting tight schedules are priorities. Several industry reports have shed light on these big-picture industry trends, including a study by FMI, a leading investment banking and consulting firm focused on the engineering and construction infrastructure and the built environment, and the BIM (Building Information Modeling) Forum. They surveyed 156 industry leaders most of whom work in the commercial sector and whose businesses, collectively, represent approximately $38 billion in annual revenue. In 2010, only 26% of the survey respondents were using prefabricated assemblies on more than 20% of their projects. By late 2016, this number more than doubled: 55% of respondents were using prefab assemblies on more than 20% of their projects. Project inefficiencies and improved technologies are driving prefabrication as a way to mitigate labor shortages and improve construction schedules. Contractors who use prefab on more than 50% of their projects are more productive and efficient compared to those who do less prefab. While many contractors struggle to make prefab pencil out, others plan to increase their investments in prefab over the next five years. Just how much can prefabrication impact a project’s bottom line, and can it really be a competitive differentiator? Join us next week as we delve deeper into this topic and take a look at the relatively small, fast-growing cottage industry of prefabrication innovators who are driving change and shaping the future of the industry. Renovating the Federal Building in Portland, Oregon cut energy usage by 45% and water consumption by 60%. A new report from the U.S. Green Building Council and the American Sustainable Business Council concludes that energy-efficient buildings are one of the most effective and economical ways to reduce the nation’s carbon footprint in response to global warming. That’s because buildings account for more greenhouse gas emissions in the U.S. than any other source, including transportation and industry. The report probes the economics of green buildings and their value in mitigating greenhouse gas production, suggesting that brick and mortar solutions to the climate challenge make for good economics in the long run. The cellular construction of the lotus leaf inspired the engineering of StoCoat® Lotusan® , a coating with self-cleaning properties, from Sto. Biomimicry is a process that employs natural organisms and systems to inspire innovation. Biomimicry has inspired technical breakthroughs for decades—one of the most often-cited examples is Velcro, which the Swiss engineer Georges de Mestral patented in 1955 after studying how burrs stuck to his clothes— but better technology and more nuanced research have enabled increasingly complex adaptions. Take the example of the lotus leaf, which has a surface texture that is “self-cleaning,” meaning that dirt particles are unable to obtain a hold on the leaves and simply flow off with the rain droplets that fall on the plant. Researchers at Sto, the building products innovator, studied this organic structure and used it as the inspiration for an exterior coating called StoCoat® Lotusan® that possesses a highly water-repellent surface similar to that of the lotus leaf. Its microstructure has been modeled on the lotus plant to minimize the contact area for water and dirt. You can get the facts on biomimicry at Scientific American.